The weather here in Ohio has been unseasonably warm which has been wonderful, but with the early dark fall of winter, I have still found ample opportunities to read. 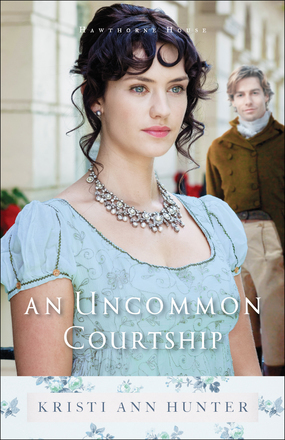 Most recently, I have been reading An Uncommon Courtship by Kristi Ann Hunter. The story is filled with challenges, growth and romance. It starts with a marriage of two young people that barely know one another and although they don't follow traditional paths, with effort and focus and a little help from family and friends, the young couple is able to slowly build a relationship and begin the journey to love. This piece of period fiction, Regency fiction to be exact, was a wonderful story with memorable characters. The author does a great job of developing the characters and helping you feel a connection to the endearing, unique characters within the story. I found myself easily relating to the shy, book-loving Adelaide whose fidgets left something on her out of sorts by the end of the evening and cheering Trent along as he warmed to the awry portions of his wife's appearance and found himself looking for ways to protect his wife from the interference of her mother and the less than scrupulous men that seemed to cross her path. The class system of the era was a huge influence on the story and there were some characters who were so focused on the societal standing that they were willing to hurt their own family members to assure their own status, yet still there were some characters were more focused on family and acceptance and worried little about their status. I didn't know it when I selected the book, but it is the third book in her Hawthorne House series. The good news is it works well as a stand alone novel and although I am a fan of following the lives of those I meet in earlier books, I don't feel like I missed out on anything by starting with the third book...of course, I would like to go back and read the first two. I know that I know where those couples wind up based on this book, but I think it would still be enjoyable to go back and learn more about them.